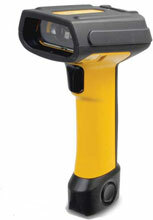 The Datalogic PowerScan PBT7100 features the fastest speed-to-read on the market - 390 scans/second. The PowerScan PBT7100 also features the Datalogic "Green Spot" and loud beeper for good read feedback, Bluetooth Wireless Technology with up to 100 m / 328 ft range and connectivity through the Base Station or directly to other Bluetooth devices. Durability is paramount, with water and particulate sealing rating of IP65, a drop resistance to 2.0 m / 6.5 ft and a 25kV electrostatic protection (air discharge), making the PowerScan PBT7100 ideal for tough environments. The Datalogic PBT7100-YB-PTR is also known as Data Logic	DTL-PBT7100-YB-PTR	or PBT7100YBPTR	.